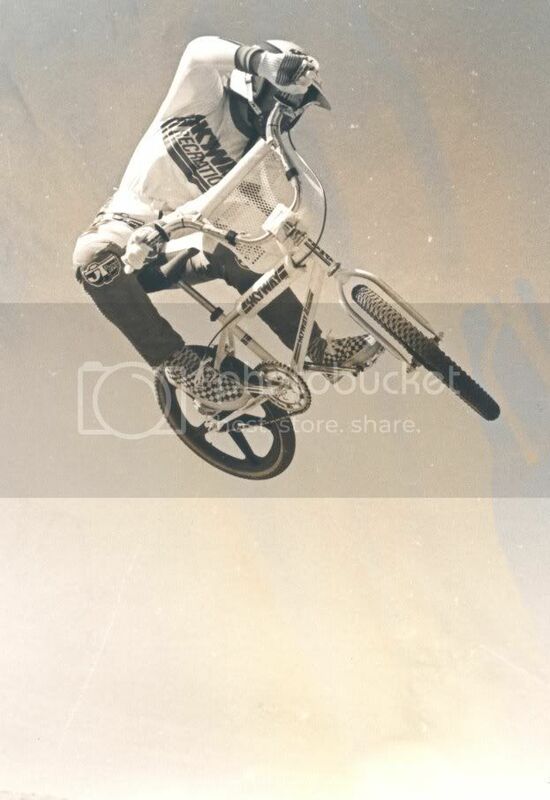 BMX Plus! december 1982 : The official word from Skyway was that the company worked on the development of the frame for over one year. Initially; according to Craig Raudman of Skyway, once the decision was made to produce the T/A frame, it took quite a search to find someone to produce the unusual tear-drop shape they needed. 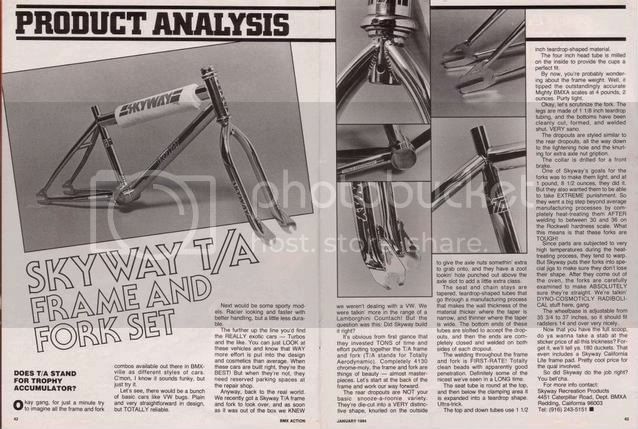 After looking everywhere in the United States, Skyway finally turned to Japan, where they found two factories capable of producing the special chrome-moly tubes. The Ishiwata Seisakusho Co. Ltd. of Japan ultimately won the job, and we must say, the job they did was flawless. There were two ways to make the odd-shaped tubing. It could be drawn through a die in the desired shape or, as in the case of the Skyway tubing, it could be drawn round then shaped in a forming die. Once the tubing was dialed in, welding it all together in the right angles became the next step. 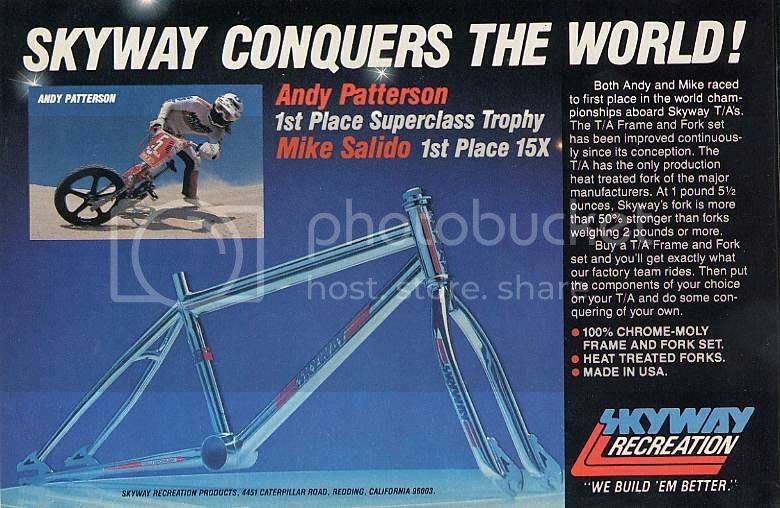 The trick for Skyway was to figure out geometry that would work as well for the huge Andy Patterson as it would for the quick and nimble pro, Bob Medrano. According to Craig Raudman, countless hours of cutting and redesigning went into the prototypes. With the .geometry finally nailed down, Raudman hopped a plane for Japan to get the final manufacturing specs on the tubing settled. As of this writing, the frames are being completely produced in Japan. The forks are welded then shipped to this country, where Skyway gives them special treatment which involves annealing, re-heat treating, and plating. According to Craig, this is done in order to assure and verify that the fork is up to spec. 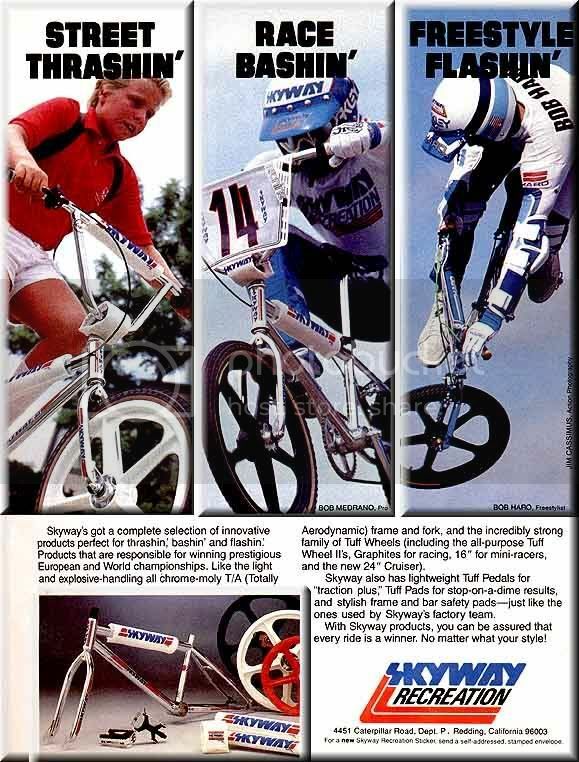 BMX Action january 1984 : It's obvious from first glance that they invested tons of time and effort putting together the T/A frame and fork (T/A stands for Totally Aerodynamic). 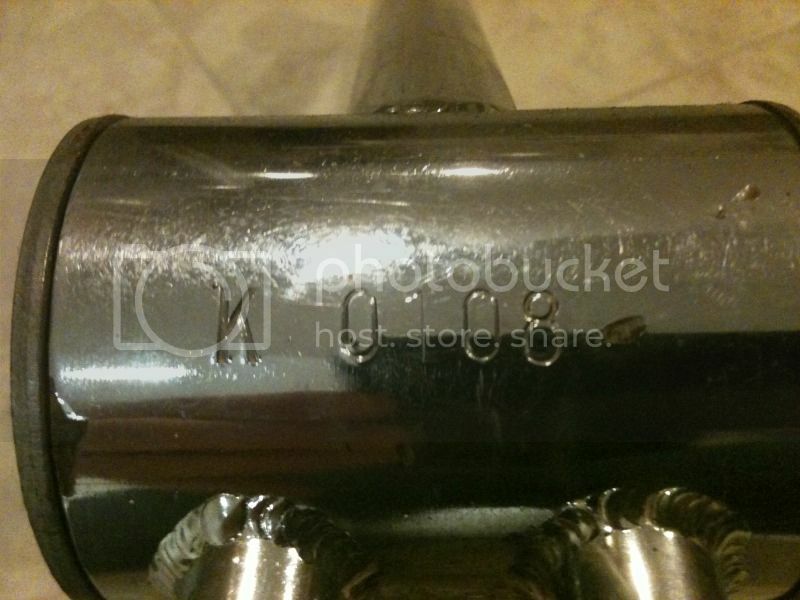 Completely 4130 chrome-moly, the frame and fork are things of beauty - almost masterpieces. Let's start at the back of the frame and work our way forward. The rear dropouts are not your basic snooze-a-roonie variety. They're die-cut into a very distinctive shape, knurled on the outside to give the axle nuts something extra to grab onto, and they have a zoot tookin' hole punched out above the axle slot to add a little extra class. 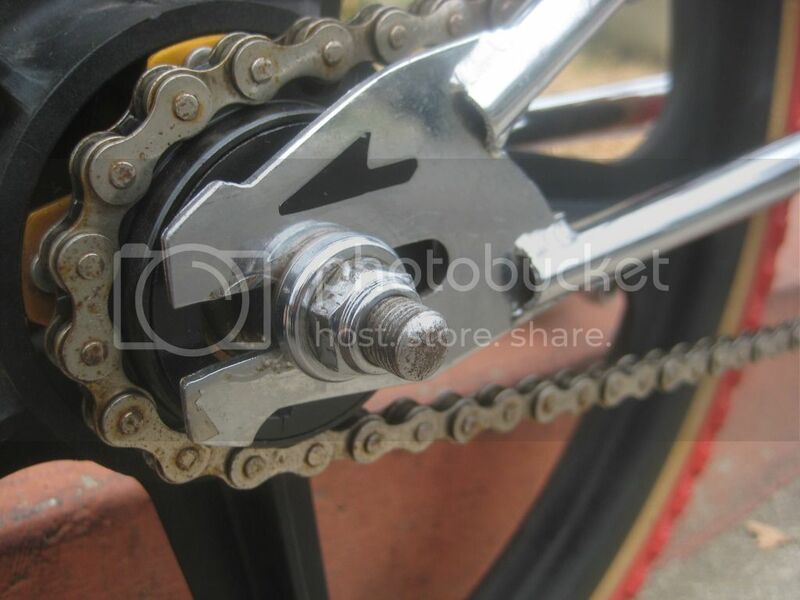 The seat and chain stays are tapered, teardrop-shaped tubes that go through a manufacturing process that makes the wall thickness of the material thicker where the taper is narrow, and thinner where the taper is wide. The bottom ends of these tubes are slotted to accept the dropouts, and then the ends are completely closed and welded on both sides of each dropout. 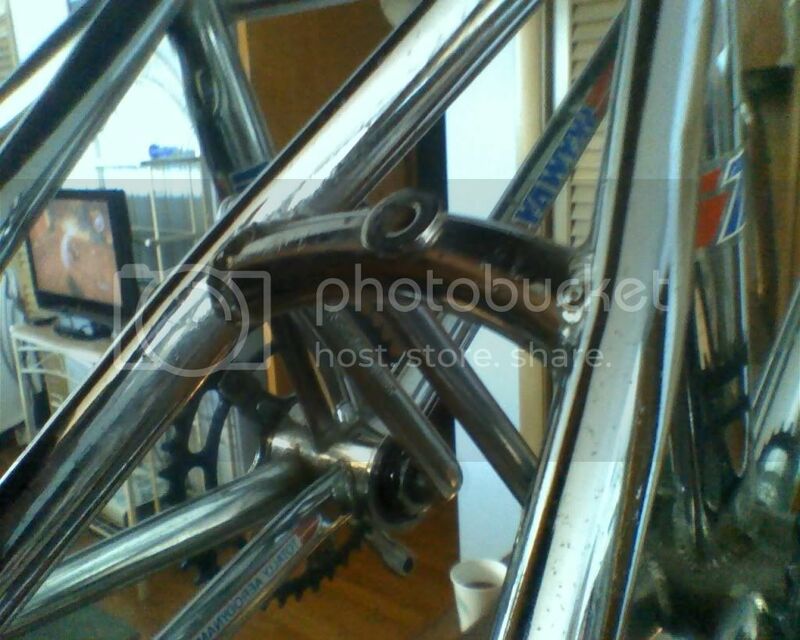 The welding throughout the frame and fork is first-rate! Totally clean beads with apparently good penetration. Definitely some of the nicest we've seen in a long time. 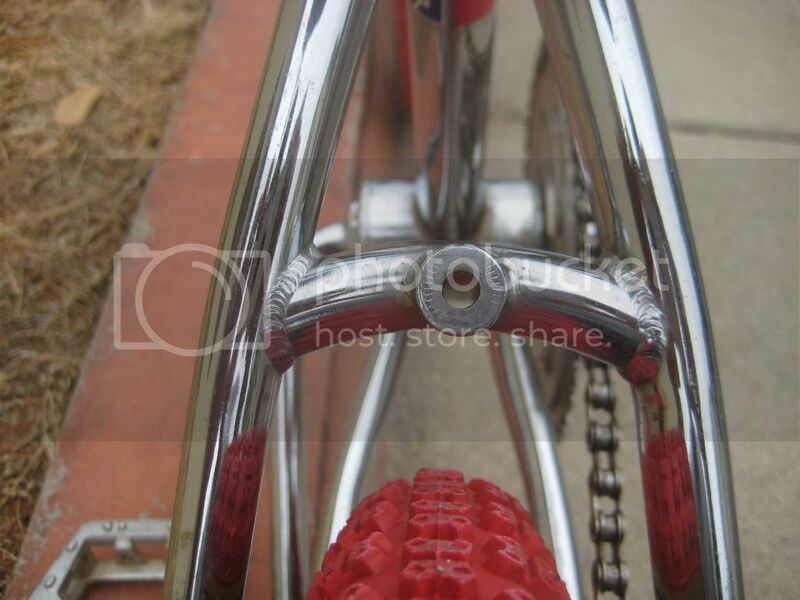 The seat tube is round at the top, and then below the clamping area it is expanded into a teardrop shape. Ultra-trick. The top and down tubes use 1 1/2 inch teardrop-shaped material. 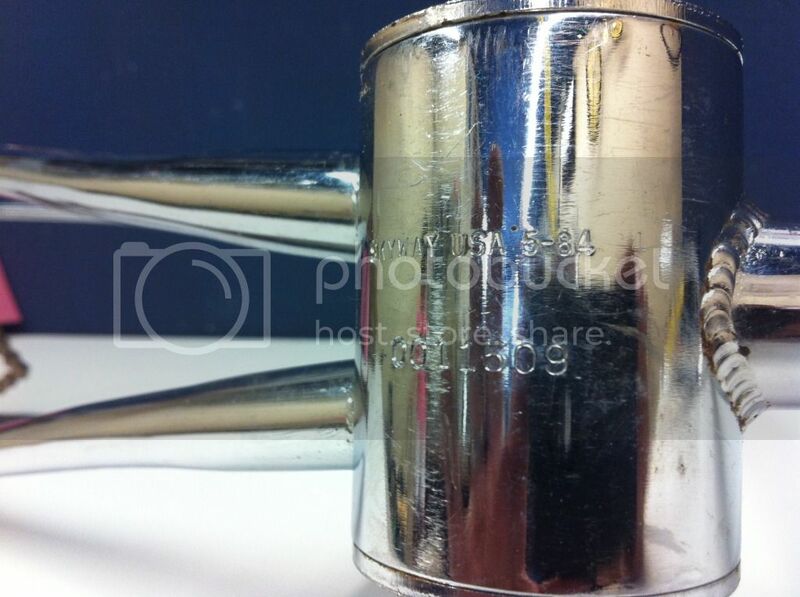 The four inch head tube is milled on the inside to provide the cups a perfect fit. By now, you're probably wondering about the frame weight. Well, it tipped the outstandingly accurate Mighty BMXA scales at 4 pounds. 2 ounces. Purty light. Okay, let's scrutinize the fork. The legs are made of 1 1/8 inch teardrop tubing, and the bottoms have been cleanly cut, formed, and welded shut. Very send. The dropouts are styled similar to the rear dropouts, all the way down to the tightening hole and the knurling for extra axle nut grip. 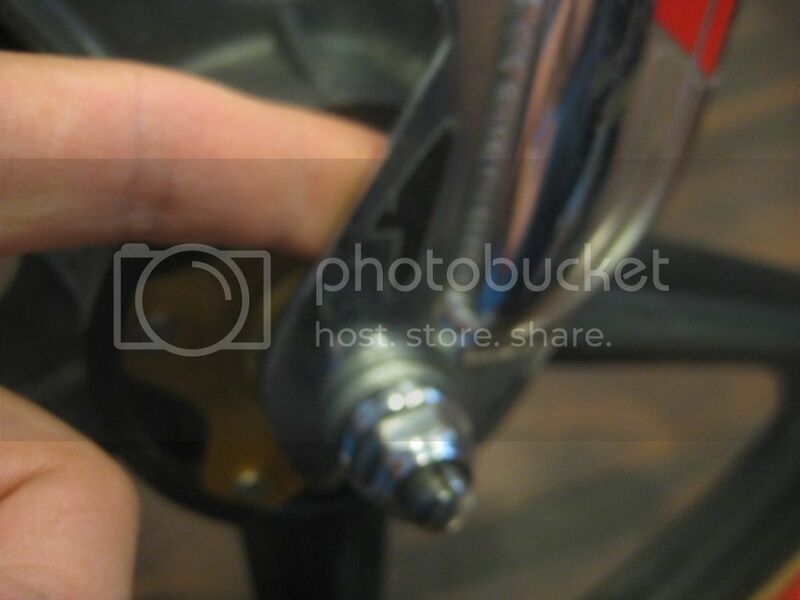 The collar is drilled for a front brake. One of Skyway's goals for the forks was to make them light, and at 1 pound, 8 1/2 ounces, they did it. 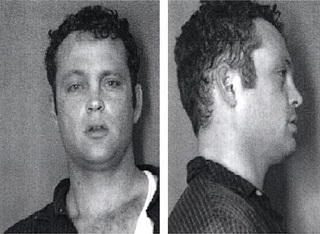 But they also wanted them to be able to take extreme punishment. So they went a big step beyond average manufacturing processes by completely heat-treating them after welding to between 30 and 36 on the Rockwell hardness scale. What this means is that these forks are tough! Since parts are subjected to very high temperatures during the heat treating process, they tend to warp. 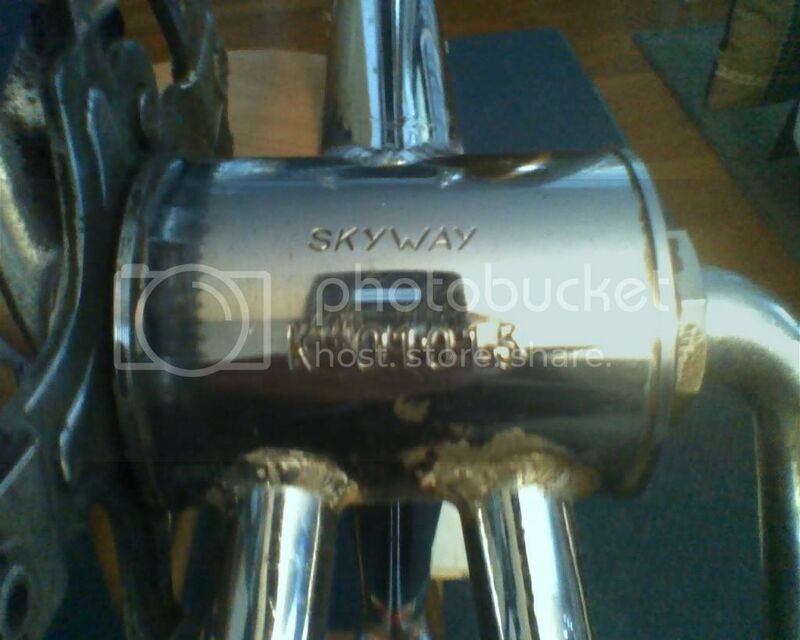 But Skyway puts their forks into special jigs to make sure they don't lose their shape. After they come out of the oven, the forks are carefully examined to make absolutely sure they're straight. 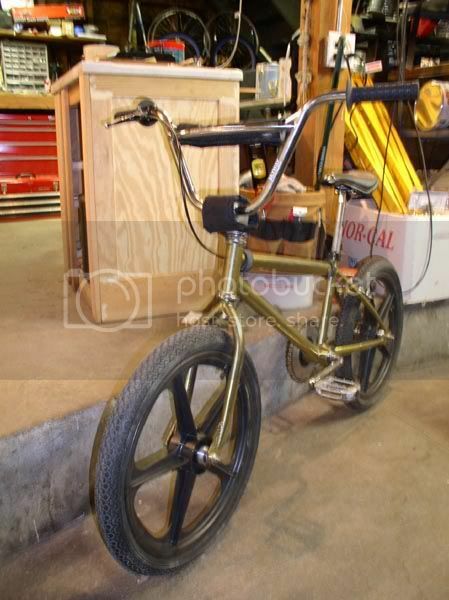 The wheelbase is adjustable from 35 3/4 to 37 inches, so it should fit radsters 14 and over very nicely. Now that you have the full scoop, do ya wanna take a stab at the sticker price of all this. Forget it, we'll tell ya. 180 dockets. That even includes a Skyway California Lite frame pad. Pretty cool price for the goal involved. K 000118 curved brake bridge- chrome- No skyway stamping or USA - Its made in Japan is why... Located in Mich.
KB 00740 curved brake bridge- chrome- located in Indiana. 07-84 0014271 straight brake bridge- chrome- located in St Helens UK Orig. from California. 04-85 0017720 straight brake bridge- white - Originally was from Chino, Cali. Now in Mass. According to Ken, none of these features would have made it onto a production frame. One of the best sites with a lot of info and videos form one of the Skyway team riders. 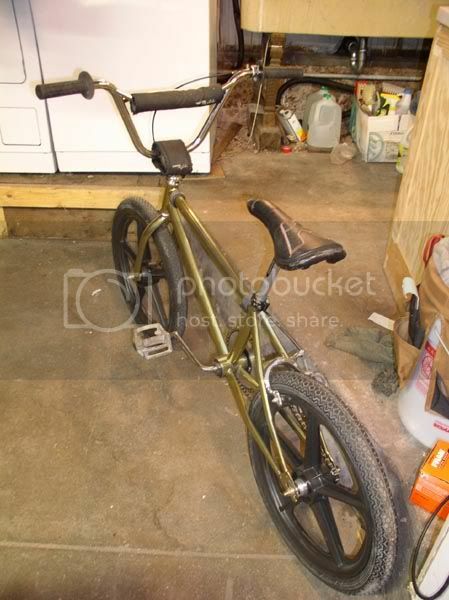 This 24" TA was discovered in 2013 in a LBS in Ca. Disabled Veteran, US Army Aviation, 4/2 ACR Special Over Water Operations, "Toujours Pret"
Since "Z" is no longer a member, I will be taking over the Skyway Registry, and will update as SN's are posted. Are we going to put the new 24 in here too? Hmm, good question. Let them hit the streets first, and we'll see what the sn holds. I will surely run it by the higher echelons. The new frames will be serial numbered. 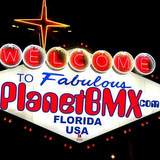 Authorized dealer for: Haro, SE Racing, Skyway, Subrosa, MCS, Sunday, Cult, Stranger, Premium & Fairdale Bicycles, and Odyssey, Demolition, Shadow Conspiracy, Primo, Premium, Redline, Profile, Cult, Proper, Colony, Answer BMX parts and accessories! We'll match or beat any other bike shop's price! That makes it easy. Thanks Ed! I would have to say if PCbmx runs more T/A designs after the 24" Xl, such as a non xl 24, a 20" xl, and 20".....I ordered 2 24's myself, but would of rather had one of them be a non xl. Just my 2cents, I need to list my other skyway in this thread as well. duh, i completely got off track of my main idea, if he only does the one run, keep them in the list, if a whole product line starts, it would be too much and just keep it 80's then. ok now im done, thank you. Thank you Coloredtuffs and Skyway for your efforts, the new frame, parts, and doing everything cool. Your facebook page rocks too. although mine isnt photoshoot ready, i would like to add it to the list. OG chrome. curved brake bridge. skyway stamp under BB. serial (K 002395). 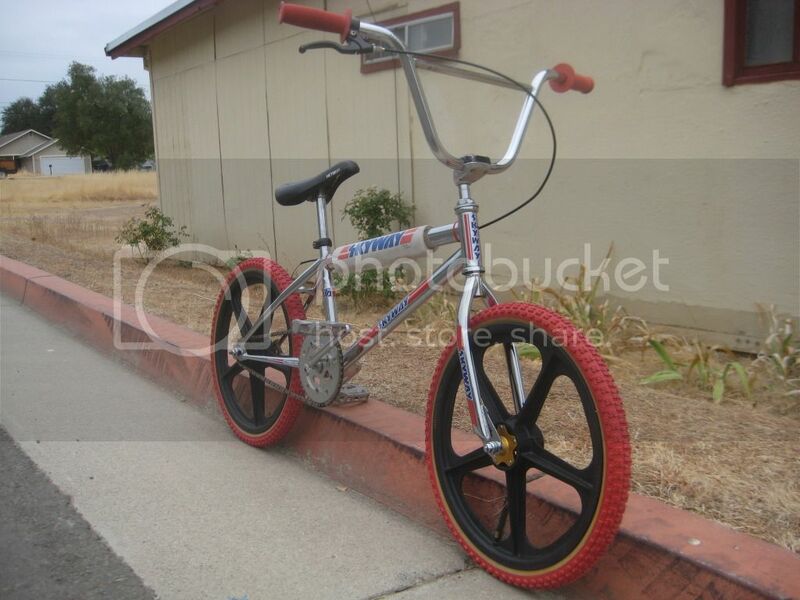 it was my cousins first real race bike. handed down to me. he has the sequential numbered one identical to it also. although, im not sure if its serial is ***94 or ***96. ill have to double check, but its characteristics are of the same and both in okc, oklahoma where they were originally purchased. anyone know for sure how many JAPAN models were manufactured before they brought the process back to the U.S.? 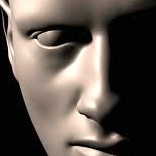 A lie goes around the world in the morning while the truth is still putting it's pants on. i have just bought K 001638, I can see that it is already on the list, just thought i would up date the list by letting you know it is now white. thats how i got it. 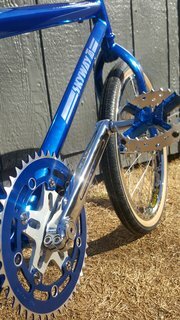 wish it was still chrome, i might but it back to chrome. Can someone define the order in which the 82 TAs were stamped, I have seen K serials with and without the SKYWAY and KB serials with SKYWAY, what came first? 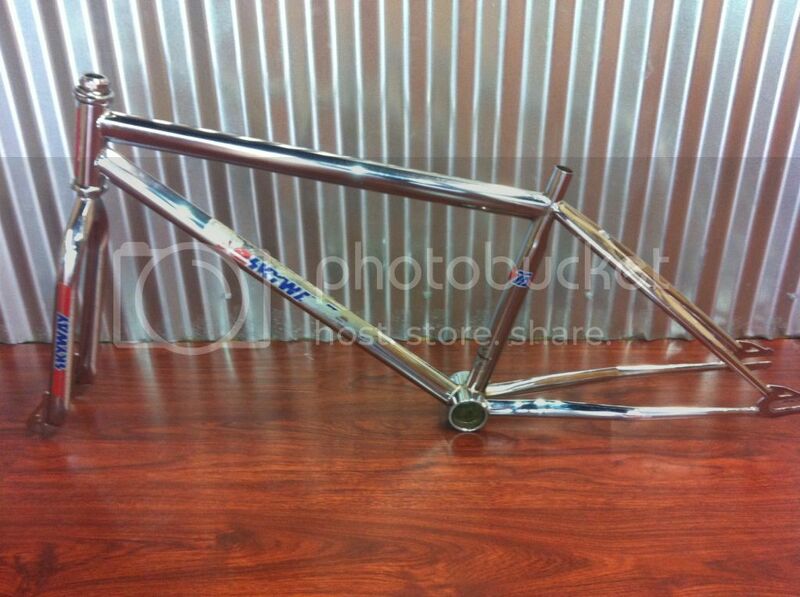 Always looking for nice / rare SKYWAY bikes, parts & gear. "is this your homework larry?" I'd like to add mine to the list, S/N: K 02671, Was purchased in San Antonio Tx in 83 or so. I paid extra for a white F/F. 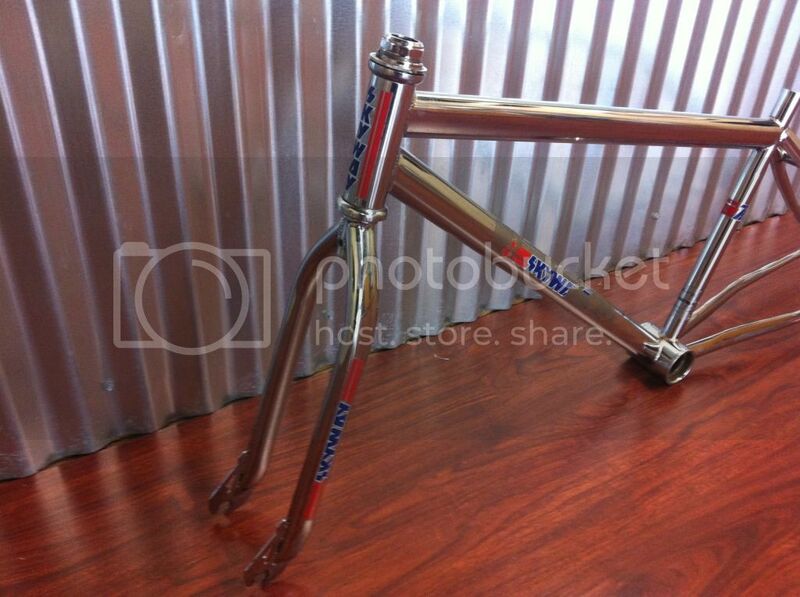 Years later after the first scratch, Found out the frame is Chrome under the powder and forks only powder coated. 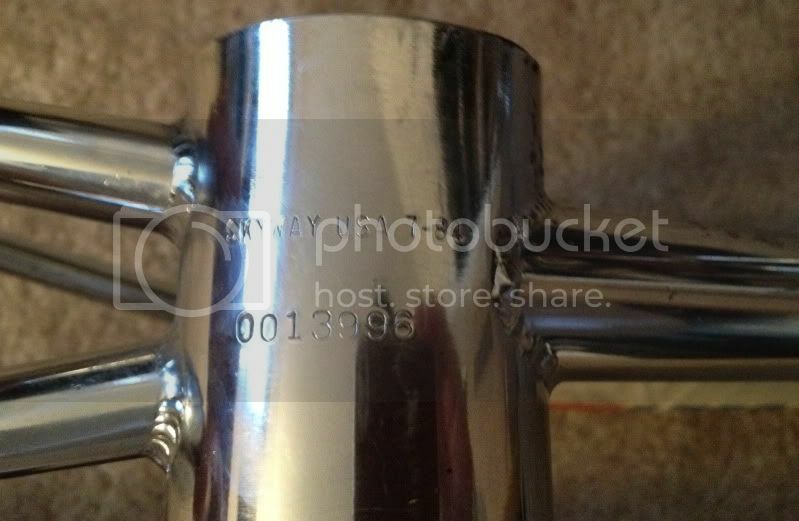 After stripping it down, MAN that Chrome was sweet! We now reside in Arizona...and shes all bright white again. I am updating the registry, and would like the brake bridge info please. Pretty sure all Japan models are curved. Ya, Mines curved! Late Japanese model. 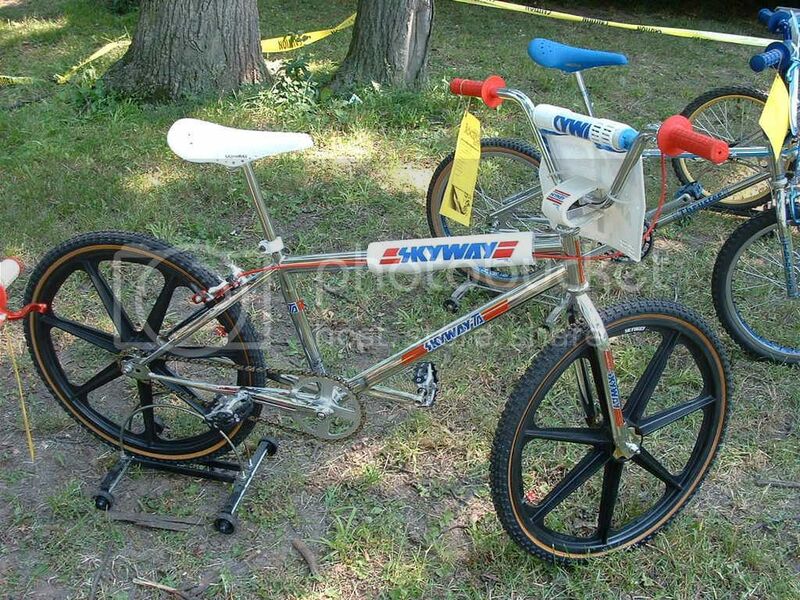 Another weird thing about mine was the downtube decal, It said Skyway TA, not just skyway as 99 percent are. The decals must have been replaced BITD, the TA version didn't come out until 84. It doesn't have to say extra long to have the TA, I'm thinking yours could have been a leftover decaled and sold in 84, do you remember what year you got it? Just before I got my first car! 1983. Most likely summertime, kinda hard to remember but I usually had money in the summer from odd jobs.